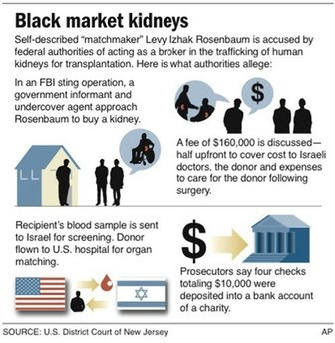 "The reporter Donald Bostrom, Aftonbladet claim that Levy Rosenbaum, a Jewish resident of New York Brooklyn, is involved in human organ trafficking. Bostrom stated that nearly half of kidney transplants conducted in Israel since 2000 were illegally purchased from Latin America, Turkey and Eastern Europe. The reporter also claimed that Israel’s Foreign Ministry is aware of the illegal trade but acted against it. Rosenbaum was arrested in July after he told an undercover FBI agent that he is a “match maker”, the agent was taping him while posing as a customer. Later on, Rabbis and elected officials were arrested in New Jersey for human organ trafficking. Rosenbaum said that he buys bodies from poor families in Israel for $10,000 and would then sell the organs to patients in the United States for $160,000.In its report the Aftonbladet newspaper noted that Israel is the only Western state that does not condemn illegal organ trade, and fails to take any legal action against the doctors and persons involved in it." Israeli officials and spokespersons have been railing against a leading Swedish newspaper for publishing a report claiming that the Israeli occupation army murders Palestinians in order to use their organs for transplants for Jewish patients. The tabloid Aftonbladet, one of Sweden’s most popular newspapers, on Tuesday, 18 August, reported that Israeli occupation soldiers had been murdering Palestinian youngsters in the West Bank in order to extricate their organs and sell them. The report carried a photograph showing the body of a victim of such an execution, with a large scar running from his chin to abdomen. The report quotes the family of one of the victims as saying that “our sons were plundered from their organs.” The report also makes a connection with the recent corruption scandal in New Jersey involving elected officials, rabbis, and illegal organ trading. The author of the report, Donald Bostrom, spoke of a strong suspicion among Palestinians that young men’s organs were harvested by the Israeli army. He suggests that the International Court of Justice in the Hague should open an investigation into the matter. Bostrom quotes a Palestinian witness as describing one case in which the Israeli occupation army shot dead a young Palestinian from a West Bank village and then extricated his organs. The Palestinian victim is identified as Bilal Ahmed Ghniyan. Israeli spokesperson and Foreign Ministry officials were raving and ranting against Aftonbladet accusing the mass circulation newspaper of indulging in “blood libel” and making “canards” against Israel . 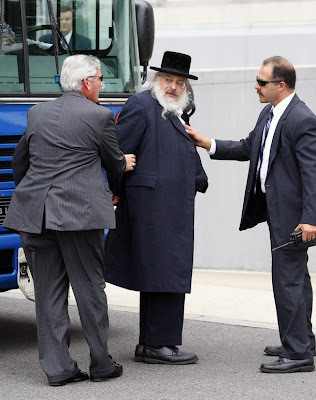 Arrested by FBI - This is Levy Rosenbaum - the Jewish Rabbi & his Jewish Termites who pays $10,000 for Kidneys from kidnapped Palestinians for his American based Human Organ Business. Other Israeli officials threatened to sue the Swedish newspaper for libel, claiming that the report was an expression of anti-Semitism. Israel has been reacting with exaggerated sensitivity toward international criticisms of its manifestly harsh treatment of Palestinians and the brazen racism associated with this treatment. Earlier this year, the Israeli army, using internationally-banned weapons launched a massive and deadly blitzkrieg on the virtually unprotected population of the Gaza Strip, killing, maiming and incinerating thousands of innocent civilians, including hundreds of children. Similarly, Israel had killed thousands of innocent civilians in the West Bank , and many of the victims were sent to the Abu Kabir forensic institute for autopsy operations. However, it is unclear if the vital organs of these young victims were always disposed of or taken out for transplant in Jewish patients. The Israeli army, which exerts huge political and legal influence in Israel, nearly always resisted scrutiny of its operations in the West Bank which are carried out in utter violation of international law, especially the international humanitarian law. In January, 2002, an Israeli cabinet minister tacitly admitted that organs taken from the bodies of Palestinian victims might have been used for transplants in Jewish patients without the knowledge of the Palestinian victims’ families. The minister, Nessim Dahan, said in response to a question by an Arab Knesset member that he couldn’t deny or confirm that organs of Palestinian youths and children killed by the Israeli army were taken out for transplants or scientific research. The Arab Knesset member who posed the question to Dahan is believed to be Ahmed Teibi. Teibi pointed out that he had received “credible evidence” proving that Israeli doctors at the forensic institute of Abu Kabir extracted such vital organs as the heart, kidneys, and liver from the bodies of Palestinian youth and children killed by the Israeli army in Gaza and the West Bank . During an interview with al-Jazeera TV in 2002, the late Palestinian leader Yasser Arafat accused the Israeli apartheid regime of murdering Palestinian infants, children, and youths and harvesting their vital organs for transplants. "They murder our kids and use their organs as spare parts` Why is the whole world silent? Israel takes advantage of this silence to escalate it's oppression and terror against our people," said an angry President Arafat. During the interview, which took place on 14 January, 2002, Arafat held up photos of the mutilated bodies of the children. "I'm not worried about myself", as the President is under house arrest, "I'm worried about the Palestinian people who have been under siege for the past 15 months." Israel had admitted that doctors at the L. Greenberg Institute of Forensic Medicine at Abu Kabir had harvested the organs of 3 Palestinian youth killed by the Israeli army near Khan Younis. After 10 days the bodies of the three victims were returned to their families for burial but with their organs and even their eyes removed. Israel never carried out a serious investigation into this and other incidents involving the extrication of vital organs from the body of Palestinian victims killed by the Israeli occupation forces. According to reporter Saira Soufan, the illegal harvesting of the organs of Palestinian soldiers and freedom fighters has been documented since before the 1990's. “Upon return of the soldiers' bodies to their mourning families, the pillage of body parts is discovered during the burial process. Occasionally, Israeli authorities steal body organs from the bodies of tourists who die in Israel . An unpublicized instance occurred in 1998, when a Scotsman, Alistair Sinclair, died under mysterious circumstances in the Ben-Gurion Airport lockup. Mr. Sinclair's parents sued the Israeli authorities upon finding that their son's heart and other organs missing. A replacement heart and organs were sent to his mother, who didn’t believe that these were those of her son's.